Martin Scorsese gave us an increasingly psychotic taxi driver making his way through a living hell of crime, slime, and filth. 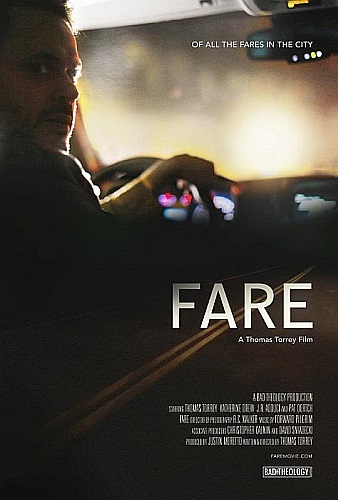 Writer/director Thomas Torrey's thought-provoking FARE (2016) squeezes everything down to the world inside the cab itself, where there's enough emotional turmoil and existential angst to blow the roof off. In particular, the true meaning of love as a thing and marriage as a condition is weighing heavily on the mind of cabbie Eric (Torrey) since his relationship with his wife is dying on the vine and he doesn't understand why. To relieve boredom and satisfy curiosity, Eric indulges in the usual small talk with passengers which tends toward the overly inquisitive. At other times the passengers make him uncomfortable by prying a bit too much into his own personal life. A profound conversation with one blithely erudite foreign man (Pat Dortch) on the nature of such things is scintillating, sharply written and played, and gets us thinking about that kind of stuff too. Later, Eric is still deep in his own roiling thoughts when suddenly, by sheer chance, his wife's lover Patrick (J.R. Adduci), gets into his cab, unaware of who's driving it. After a lengthy cat-and-mouse exchange about illicit love and infidelity, Eric spills the beans to his shocked--and now captive--passenger, beginning a vindictive mind game whose outcome, we fear, will depend on just how deeply his wife's betrayal has warped Eric's psyche. This leads to the kind of tense, character-driven interplay one would expect, played out with the dramatic intensity of seasoned stage actors pouring it on before a rapt audience (but in dazzling cinematic style). When Eric's wife Audrey (Katherine Drew) is drawn into the conflict as well, the uneasy triangle generates enough heat to spare. Eric leaves the city and carries them all down a lonely road into the dark night, and we wonder how the situation will be resolved. This is when Torrey's screenplay suddenly takes a sharp left turn and plunges headlong into thriller territory, as though the cab had just entered "The Twilight Zone." Things escalate quickly from there. I don't want to give anything away--suffice it to say that the darkness that the cab's headlights have been struggling to pierce suddenly becomes terrifying, and our attention is riveted to the screen as we try to glean any available clue as to what the hell is going on. Torrey's climactic sequence is tense and powerful, building masterfully to one stunningly symbolic moment that may stay in your memory long after the movie is over. It's a breathtaking image, worthy to stand alongside some of the most indelible images in film. Following this edge-of-your-seat sequence is a curiously unresolved ending which first had me feeling unfulfilled, even cheated. But then I realized that the story's impact is just as strong, and perhaps even more so, with some of its dark areas left unilluminated. As a debut director, Thomas Torrey does an impressively deft job of handling the visuals in an interesting way--this is most satisfying low-budget filmmaking--while turning in a gripping performance in the lead role. Katherine Drew and J.R. Adduci are also first-rate, as is Pat Dortch as the mysterious foreign passenger who not only gives Eric a few new angles to ponder but also seems to foreshadow what is to come. FARE takes its limited premise and works it for all it's worth, until we forget that it's all taking place inside one vehicle with only a few characters. As for the ending--the more I thought about it, the more I realized that I was enjoying thinking about it. And putting some of the pieces together myself.